to the races! and there will be some hats there too of course. a big thank you to everyone who did some last minute naming for me. This entry was posted in cosyknitsliterally, cosyspins, craftfairs, handspun, spinning by cosymakes. Bookmark the permalink. Have a wonderful time, and good luck! 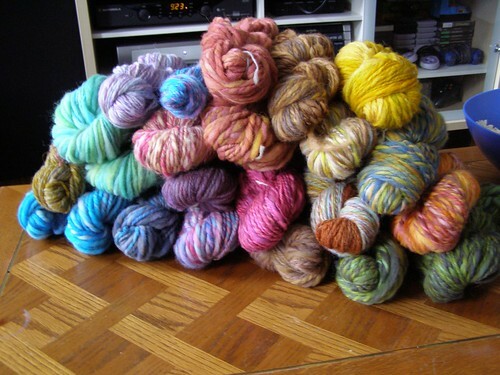 I want to dive into that pile of yarn; it’s just so smooshy and the colors are so vibrant! Cosy~ These are beautiful. I have just started visiting your sight and it is so colorful and makes me feel comforted, looking at your yarn. I totally love my yarn! Thanks so much. I hope to have a table at the next I Made It. Oh no!! I’m so sorry I couldn’t make it out to the show today; I was so looking forward to it. But it seems I’ve caught the bug that my kids are sharing and I’m down and out for the count. Let me know if the little blue stem doesn’t sell… I absolutely love those colors and I’ll snap it up in a sec. I hope you had a good amount of business! Also, I finally got my blog up and running, if you want to take a look (she asks shyly). I had a horrible week of working with MovableType and moved everything over to WordPress with Much Happiness! I don’t have much there yet, but I’m building it up! Oh no!! I gave you the wrong URL before… it should be right with this post. 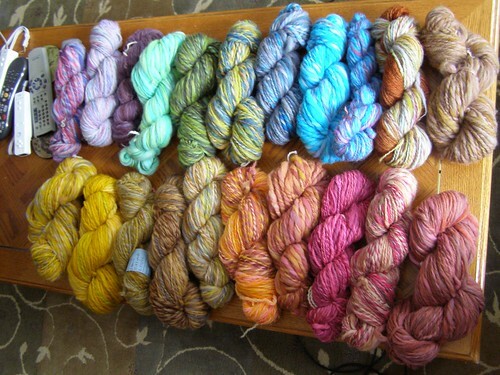 Such a gorgeous pile of yarn! Your eye for colour is amazing. Good luck at the fair! What a shame this was happening at the same time as the Knitting Festival! Your yarn looks so amazingly beautiful.